Afsaneh Moradian, Bea Abbott, Héctor A. Rivera and Brian Napoletano report from Mexico and the U.S. on the progress of the migrant caravan through Mexico — and on the inspiring displays of solidarity at every stop that set an example for activists in the U.S. — for Socialist Worker. 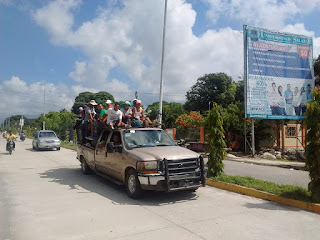 Members of the caravan in Mapastepec, Chiapas on October 25. Photo by José Manuel Mojica Vélez. The solidarity that the caravan has received in Mexico is an important source of hope. If popular support and mobilization was able to compel Mexico’s authoritarian government to avoid overt use of force against the migrants — at least so far — then supporters of the migrants in the U.S. can take confidence that that their initiatives can have an effect as well. Read the full article online at Socialist Worker.